Great writers need to be great analysts in order to fully understand the mechanism of their stories. Within every great narrative sits a comprehensive and elaborate tapestry of story points. The reason a particular story feels good eliciting that Oh, that’s a great movie reaction is because these points resonate on a frequency that touches upon the way our own minds work. Those looking to communicate effectively with Audiences across the world must understand this narrative code that rests at the foundation of every great story. This week we publish the second in our Storyforming series—Storyforming: The Dark Horse. Written and directed by James Napier Robertson and starring Cliff Curtis as Genesis, the real life savant who helped disadvantaged children in New Zealand develop the skills and confidence to compete in chess tournaments, The Dark Horse inspires because of its complete and fully-developed narrative structure. From character to plot to theme to genre, the storyform that fuels this narrative finds evidence throughout the entire movie. In Dramatica, a storyform is a unique collection of seventy-plus story points that work together to form a holistic image of the Author’s Intent. Authors use competing points-of-view and alternative approaches to solving problems to argue their own points-of-view on the best way to resolve the issues in our lives. For most, this is a hunt-and-seek process that involves several rewrites before the argument begins to take shape. With Dramatica, Authors can identify what it is they want to say with their story and then receive a comprehensive structure that helps support that point-of-view. By analyzing a narrative through the eyes of Dramatica—particularly one as comprehensive and meaningful as The Dark Horse—Authors can develop the skills necessary to effectively recognize and appreciate their own story’s unique set of story points. The more familiar an Author becomes with a storyform and how each and every part relates, the more comfortable and confident they become when it comes to structuring their own stories. Before diving in to the deep thematics present within each and every scene, the analyst must first identify the Four Throughlines of the story. 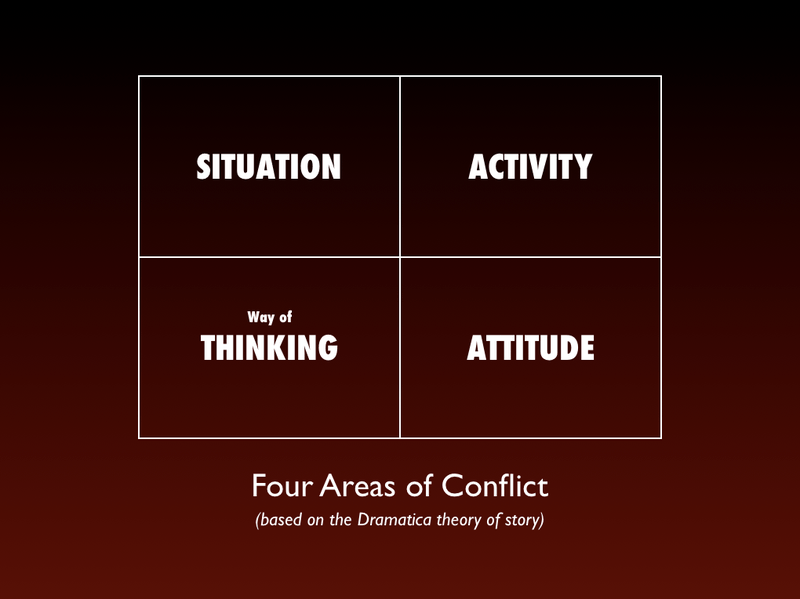 In Dramatica, these four areas align into a quad where the external conflict sit on top, and the internal conflicts rest on the bottom. The fixed conflicts find themselves diagonally across from one another as do the processes of conflict. From there, the analyst begins identifying the answers to dynamic questions that pinpoint the forces that twist and turn the narrative. 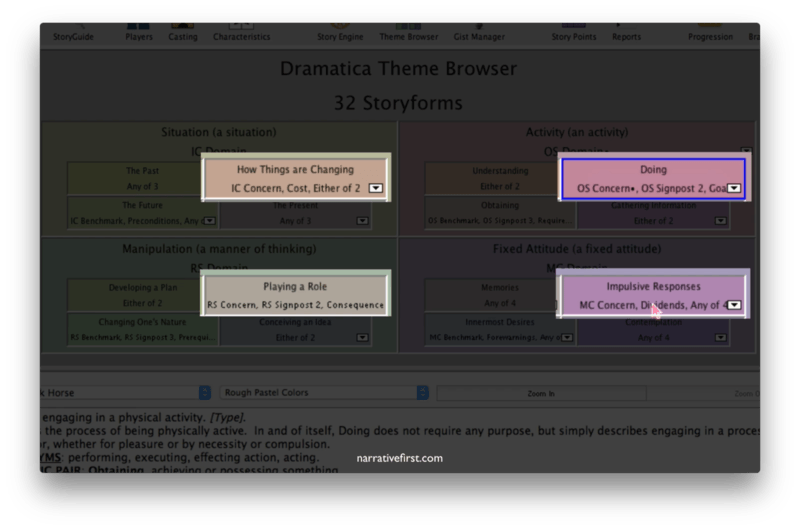 Dramatica begins with 32,768 possible storyforms. Answering these questions helps narrow down the possibilities and focuses the story engine in on the Author’s original intent. Main Character Resolve Does he Change the way he approaches problems or does he Remain Steadfast? Main Character Growth Does he hold out for something to Start or something to Stop? Main Character Approach Does he prefer to solve problems externally as a Do-er, or internally as a Be-er? 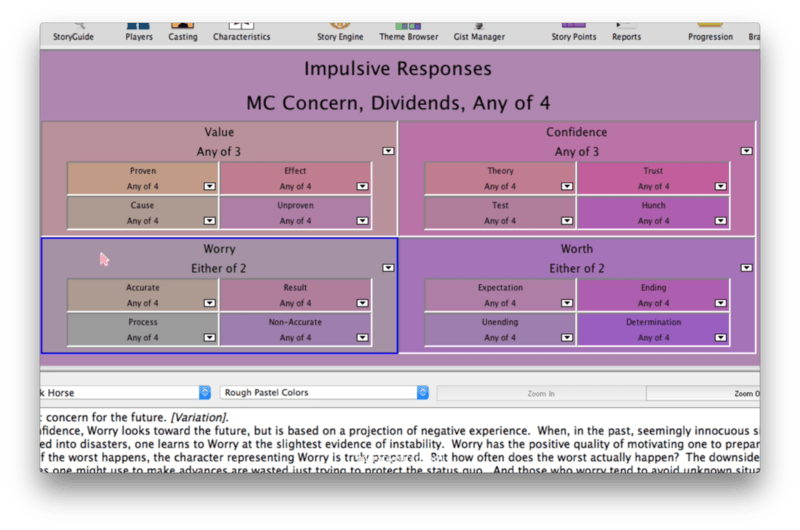 Main Character Problem-Solving Style Does he approach problem-solving Linearly or Holistically? The first and third questions find an easy response: Genesis is both Steadfast in his resolve and approaches problems internally as a Be-er. The nature of the second question provides ample opportunity for misappropriation of focus and therefore sits without an answer. In The Dark Horse, Genesis appears to solve problems both Linearly and Holistically and therefore this question goes unanswered as well. He appears to be a Linear thinker, but his temperment and disability clouds the answer to this important dynamic question. Story Driver Do the efforts to improve the lives of these children progress because Actions force decisions or because Decisions for Actions? Story Limit Do the efforts to improve the lives of these children reach a climax because of a Timelock or an Optionlock? Story Outcome Do the efforts to improve the lives of these children result in Success or Failure? Story Judgment Do the efforts to improve the lives of these children appear to be a Good thing or a Bad thing? All four find easy answers: Actions drive decisions, the story reaches a climax because of a Timelock (the deadline for the chess tournament), and the efforts to improve the lives of these children result in Success and are shown to be a Good thing. With these six questions answered and the Four Throughlines assigned to Domains, Dramatica narrows down the possible storyforms from 32,768 to 128. After identifying the forces behind the narrative, the analyst now turns their attention towards the Static Plot Points of the story. The first and perhaps most important of these rests at the Plot level of the model and determines the focus of Concern for each Throughline. When choosing a Concern for one Throughline, the analyst automatically chooses the the Concerns for the other Throughlines: they will locate themselves in the same relative location as the first choice. If the analyst chooses an Overall Story Concern of Obtaining for The Dark Horse, the Main Character Concern would be Innermost Desires, the Influence Character Concern would be The Future, and the Relationship Story Concern would be Changing One’s Nature. Obtaining, Innermost Desires, The Future, and Changing One’s Nature all sit in the bottom left hand corner of the model. If the analyst chose instead an Overall Story Concern of Understanding for The Dark Horse, the Main Character Concern would be Memories, the Influence Character Concern would be The Past, and the Relationship Story Concern would be Developing a Plan. Understanding, Memories, The Past, and Developing a Plan all sit in the upper left hand corner of the model. Narratives rely on focused and meaningful story points to create a comprehensive understanding of the Author’s message. Locating these Concerns in the same general location improves the resonancy of the message and ensures a consistency of purpose in each Throughline. In The Dark Horse, the Overall Story Concern of Playing Chess finds itself in Doing, the Main Character Concern of Reacting Impulsively finds relevance in Impulsive Responses, the Influence Character Concern of a Body Succumbing to Cancer finds resonance in How Things are Changing, and the Relationship Story Concern of Who Plays What Role in the Family finds a home in Playing a Role. Identifying these Concerns brings the total amount of possible storyforms down to 32 storyforms. Lastly, the analyst looks to the Issues within each Concern and approximates which pair sounds more like the source of conflict within each Throughline. In The Dark Horse, the personal Issues of Genesis belong to either Value & Worth or Worry & Confidence. He seems less troubled by the relative value and worth of things than he does his own anxiety and lack of self-confidence, so Worry & Confidence it is. Between the two, Worry seems the strongest contender for the source of trouble in his life. For Genesis, Non-Accurate—which in Dramatica means outside of tolerances or inappropriate—looks to be either the Problem or Symptom of his Throughline. Either he sees his inappropriate behavior as a problem (Symptom) or his true source of drive eminates from living outside of tolerances. The analyst then checks both options, looking to the other Throughlines for confirmation. By comparing Dramatica’s predictions for the other perspectives against the one the analyst feels most strongly about, a greater understanding of the narrative thematics at play begins to materialize. 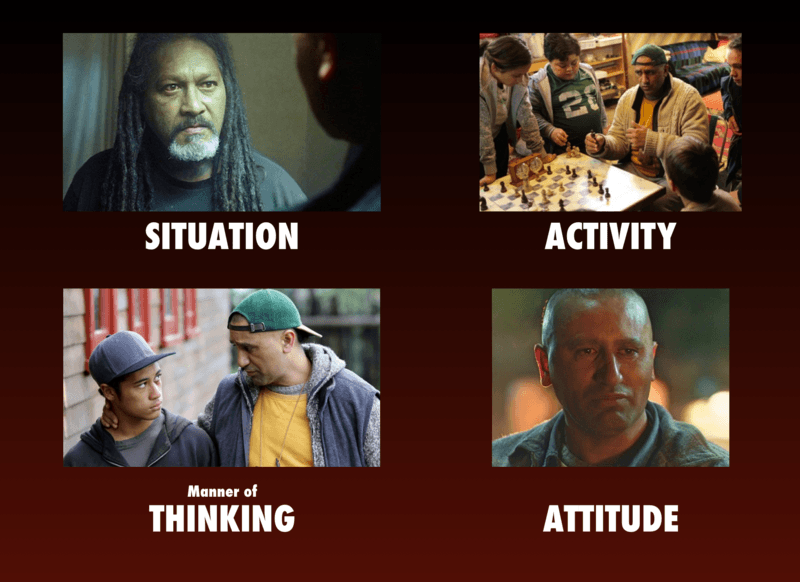 The selection of Non-Accurate as the Main Character Problem resonates clearly in the other Throughlines and leaves the analyst with 2 possible storyforms. The one remaining story point to identify? 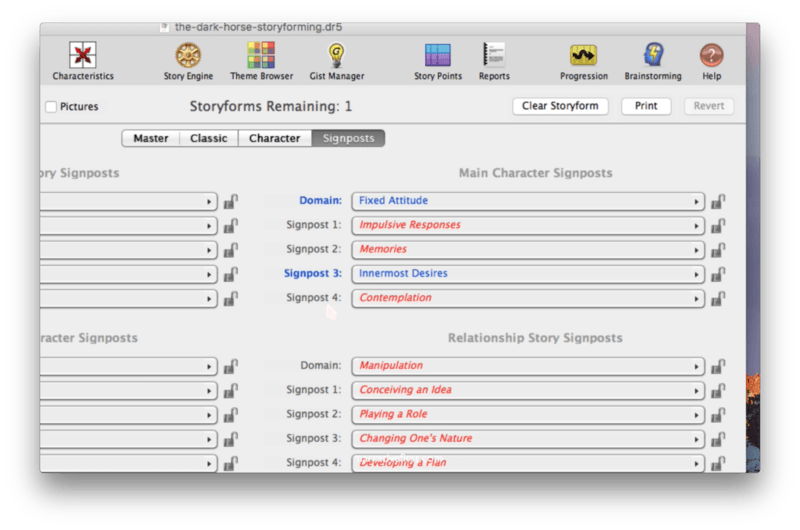 The Main Character Problem-Solving Style. If a concrete choice still eludes the analyst, they must turn to other areas to help answer this final question. Turning towards the Signposts of each Throughline, one finds that Dramatica narrowed down the 3rd Signpost for Genesis (what most people consider Act 2b) to either Innermost Desires or Contemplation. Signpost 3 finds Genesis alone in his van, smashing out the window in a desparate attempt to feel the rain on his hands. The rage that explodes from him identifies completely with Innermost Desires, not Contemplation. By making this choice, the analyst brings the number of possible storyforms down to one. 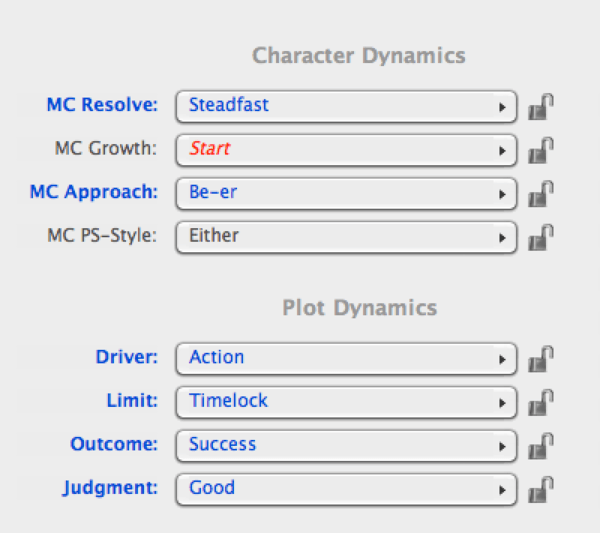 Looking at the Story Engine Settings window, one finds story points in both red and blue. Blue represent choices made by the analyst, red represents what Dramatica predicts the other Throughlines should cover given our selections. A comprehensive examination of those red story points confirms our selections and speaks volumes as to the power of Dramatica to accurately predict a story based on a limited number of choices. James Napier Robertson wrote this story and wrote it magnificently. Dramatica simply predicted what he would write about. Many think Dramatica a tool for analysis; something that can and should only be done after the Author’s initial draft. By understanding how to accurately analyze a work as amazing as The Dark Horse, the analyst develops their own perception and comprehension of the structure of a functioning narrative. As knowledge grows, so too does intuition. A comprehensive regimen of analysis and action (writing) increases the Author’s story sense and improves their value both at home and in the story room. After all, the process of rewriting requires an analysis of what is there first…competent Authors must be both artist and analyst.